Book with us and receive a 3/day/ 2 night St. Petersburg extension package at no additional cost! 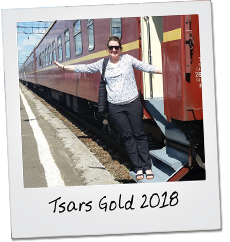 Don’t book a Tsars Gold Train Journey until you have read our FREE guide with exclusive offers. We are a full member of the Australian Federation of Travel Agents (AFTA) and an agency registered with the AFTA accreditation Scheme (ATAS). ATAS is a national accreditation scheme, endorsing travel agents who have met strict financial and customer service criteria. We had a great time. We enjoyed the whole trip and everything ran according to plan. It was good to have the train carriage to ourselves and we chatted with others on the train. It was wonderful and made life so easy to be met at the stations and taken to the place we were going to. It is hard to have a favourite spot but I think Mongolia was just such an interesting place. So poor but everyone was helpful and kind. Wonderful.